This investment makes sense: Your website is the hub of your digital presence, your most widespread marketing tool, and a 24/7 salesperson for your brand, so of course you want to invest all the appropriate resources in it to make sure you get it just right. But it just breaks my heart to see companies go through all that work and end up with a website that still doesn’t fulfill its purpose. Why do so many websites fall so short? The reason is simple: They've made their website about themselves, instead about their customers. No matter how many resources you’ve poured into the new site, it’s just not going to help you achieve the success you’re dreaming of if you don’t make every decision with the customer in mind. Putting yourself before the customer is, without a doubt, the biggest website mistake you can make. Imagine that you are a small business owner who’s having some trouble and is considering hiring a consultant. What do these pages say to you? At first glance, it seems like Slalom has their act together. Big, crisp pictures, a modern tiled layout and a simple color scheme all portray an image of efficient professionalism. But is it working for their viewers, their potential customers? Not really. 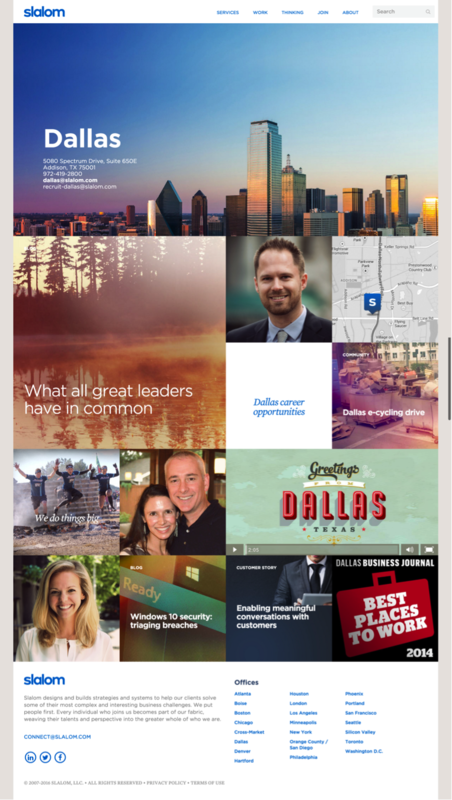 The only content “above the fold” — what you’d typically see when opening this site in a browser, before you start to scroll down – is just their name (with no tagline explaining what they do), the navigation bar, a big Dallas skyline and a couple of other unrelated pictures. At this point, I have no idea if these guys can help me with my small business problem or not. As I continue to scroll down, the content is all about them and what they do, with no effort made to link that back to the problems I might be having as their customer. It’s their blog post, one of their people, their map, their job openings, their latest charitable venture. The tiled layout is also a problem, because with no clear hierarchy, I don’t know where to click to find the answers I need. And their only “About Us” information, in the bottom left of the page, is so vague that I still don’t know if these are the right guys for me. My immediate impression is that these guys are failing from a design perspective. Their site is clearly outdated, and I’d love to help them get a facelift. But despite these design shortcomings, look at all the ways they’re reaching out to me, their potential customer. They have a detailed case study right on the home page that lets me know exactly the kind of services they offer (and makes them look good, to boot). If I’m not much of a reader, I can watch a video about this case study instead. There are testimonials in the right-hand column, from people I can relate to, saying that RMoon not only rescued their companies but also changed their lives — and hey, look, that’s what their tagline at the top of the page says, too. Also, the list of services underneath the navigation bar lets me quickly assess whether I fall into one of the categories they serve (although I wish those categories were clickable). All in all, I’m far more likely to keep learning about RMoon, even though they don’t have a slick new design, because they’ve made it incredibly easy for me — their potential customer — to see myself in what they’re talking about right on their home page. So how can you avoid making this mistake? Here are four suggestions to ensure that your website stays customer-centric. 1. Determine how your products and services meet your customers’ needs. You can’t build a customer-focused website unless you know who those customers are and how you’re helping them. 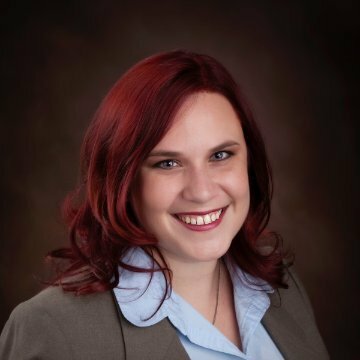 Dust off those old User Profiles from your marketing team — or, if you’ve never made user profiles, it's time to start. Who is your target audience? Who is your ideal customer? What are their needs? It may not be the most fun exercise in the world, but it is crucial to your website’s success. You have to know who your potential customers are so that you can customize your site to meet them where they are. Fantasy.co is a design agency. Their website gives a list of all areas they work in on the bottom, and the question posed in red and black changes to give a new one potential clients of each area may relate to. Not only this, but clicking each area brings you straight to the case studies of their biggest clients! The home page for Slalom, above, doesn’t have a single Call To Action, or CTA, which is a big reason their visitors will feel lost. What is your goal for the people who come to your website? What do you want them to do? This can be as simple as a hyperlink (“See our Services to learn more about how Slalom can help you”) or as complex as a big dowloadables button (“Click here to download our free e-book on Small Business Solutions”). Or maybe you just want them to get in touch with you, so you make your phone number and e-mail address big and clear and invite your website visitors to drop you a line. FreshBooks.com says who they are and provides a call-to-action for their free trial immediately. as well as how customers can try it out for themselves. Whatever your goal is for your site visitors' next steps, you need to make it clear. This is true, not only for your home page, but for every single page of your website. Imagine that you’re guiding your visitors through a tour of your company — which, in a very real sense, you are. You want to gently take them by the hand and show them how you can help them, where they can get more information, and how they should contact you when they’re ready to reach out. Chances are, your website copy is all about you: your company goals, your way of doing business, your product specifications. It’s true that visitors need that information, but it should always be presented in a way that makes it clear what you can do for them. Focus on benefits rather than prices and specifications. Show how you’re going to make their lives better. Imagine that you’re the premier racquetball sports center in the county. If that’s the case, you’re probably pretty proud of this distinction, and you’ll say it a lot, all over your website. Well, that’s fine as far as it goes, but it’s absolutely useless as a statement of benefits to your customers. Notice how each of these statements speaks to a perceived pain point in the audience — waiting times, lack of equipment, and cost — and addresses it by showing the benefit your company can provide. Speaking with your customers’ needs in mind makes you instantly relatable and positions you as a friendly and helpful resource — unlike all those other shops that are only tooting their own horns. 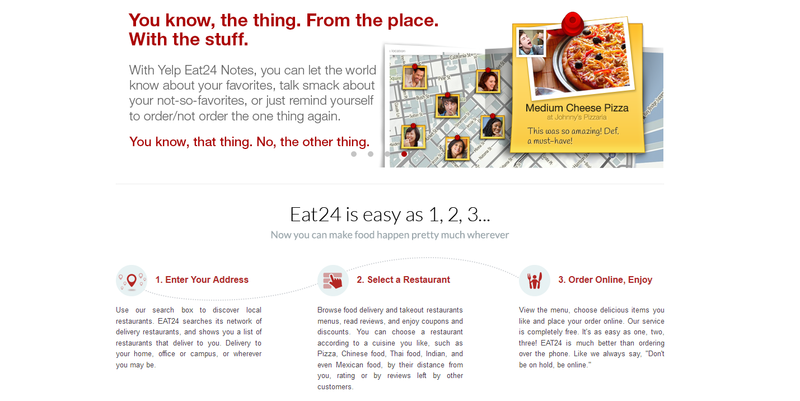 The copy on Eat24 isn't just fun to read; it's also really helpful to potential customers! They explain how easy their service is to use and include benefits in an engaging way that matches their brand ("Remind yourself to order/not order the one thing again. You know, that thing. No, the other thing."). 4. 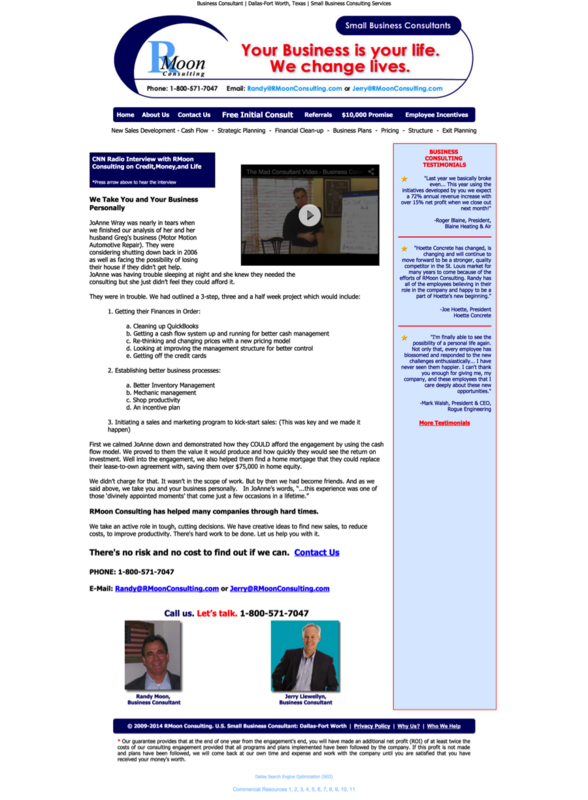 Provide case studies and testimonials. Word of mouth is still the most powerful sales tool on the planet. We are all human and we trust other humans who are telling a story about how their life was made better. Let your customers share how much you’ve helped them, and feature those stories prominently on your website. Case studies, testimonials, infographics, before-and-after pictures and short videos all make a much better case for why someone should use your business than you can. Even better, these stories immediately begin to develop a trust relationship with your potential customers. 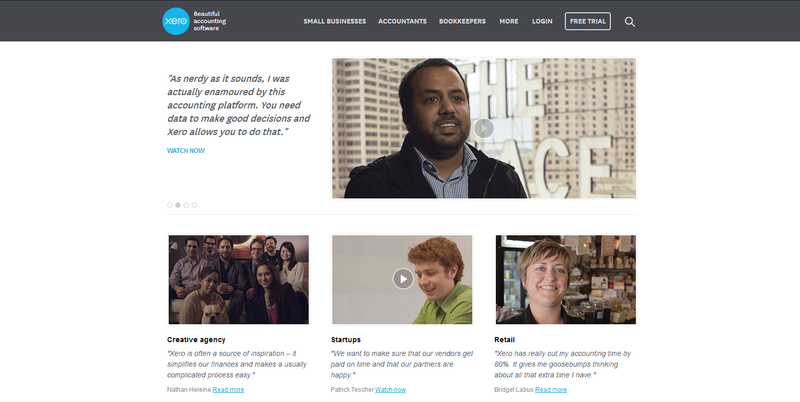 Rather than being just another faceless corporation, you become “that nice company that helped so-and-so.” Xero features a photo or video with every testimonial, and provides a label of their industry. This demonstrates they help real people. Clicking "read more" gives specifics on how they help people of that industry — or, in other words, how they can help people just like you. The best part is that you can implement most of these changes without a full website redesign. Changing copy, promoting testimonials and adding solid CTAs are all things you should be able to do within your existing content management system. (If you can’t, you’ll want to look into that problem.) And your website visitors will thank you: by staying on your website longer, by following the CTAs you’ve laid out for them, and by becoming valued customers. JJ Lonsdale is a former madison/miles media team member.